Do you have a special kid? A kid that has some special learning needs? If so, you have probably spent a lot of time and money getting resources to use to help your child learn easier. I know I have both as a parent and a special education teacher. In fact, I have access to companies that many homeschoolers have never heard of, but the resources can be very expensive. I now have the site that works for me, and you will pleasantly surprised at the diversity and affordability of products. Heads Up! Is a special needs company that provides many different types of resources for all kinds of special kids. You will find pressure blanket toys for autistic children, various colored reading frames for low vision and learning disabled children, self-stimulatory prevention aids, etc. The products are all very affordable and durable. Most products from other places tend to be very costly and more suitable in a professional therapist’s office. The products of Heads Up! are durable, but are simply made to be easy to use and more affordable. I was provided many of the colored frames which have different colored transparent films to lay over the written page. Students with all kinds of problems find specific colors for their issues that make reading the printed word easier by cutting glare, providing contrast, etc. All of my students enjoyed trying the different frames to find one they felt helped them the most. Even my regular education students without learning or vision difficulties found that a certain color reduced the glare helping them to read longer without tiring their eyes. Several even picked out some games and computer software they want to try from the Heads Up! catalog which is overflowing with so many diverse products. 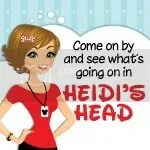 To help you with all of your students’ needs, go to http://www.headsupnow.com. Are you struggling with teaching math like Algebra II, or does your struggling teen need a basic math quick review? Most of you have probably seen the ones that are curriculum specific such as Saxon Dive CD’s, or Bob Jones’s DVD’s. They are just fine, but if you aren’t using those curriculums, they won’t help much. Well, the MathTutor DVD’s are great for just these kinds of times. The instructor for the entire product line is Jason Gibson. He isn’t a teacher, but he is a mathematician in all ways with a Master’s in Electrical Engineering and a Master’s in Physics. Jason knows how to bring real-life application into the classroom. His no-nonsense, straight to the point style is refreshing for most students, especially those who are math weary and really want to see the light at the end of the tunnel. Jason gives step-by-step instructions working through easy problems to fully explain the concepts. He then works through numerous problems progressively getting to the hard-core problems. He is very capable of teaching complex topics in a short amount of time. He doesn’t use any textbook, so the student can view the material regardless of the curriculum to gain a better perspective of the concepts. These are the reasons that make these products so good for many students of all ages. They can be used for first time teacher-approached lecture for curriculums that do not have a video component. They can be used by struggling students, and students who need a quick review for any reason. The subjects covered in these series include basic math and basic math word problems. There are fractions and Algebra I and II. You will find geometry, trig, calculus and even Advanced Calculus. There is also statistics and Physics. The best thing about these series is that they are affordable. Prices range from $26.99 for most topics to $49.99 for Calculus 3: Volume 2. This makes great help easy to come by. Now anyone can hire that math tutor and feel confident that success is only a few hours away. Check them out at www.mathtutordvd.com. Homophones are interesting if you can remember what they are. Do you remember? Homo means the same and phone is pertaining to sound. That is what I need to remind myself of the full definition. Homophones are words that sound alike, but are spelled differently and mean different things. No and know would be two examples. Problem is that many people regardless of age still confuse them when using them in sentences. Many things have been tried. Many may work, but I have found “All About Homophones” by Marie Rippel for grades 1-8, and I think the students will really enjoy it which usually means they will learn and remember! In what the author calls the tool-kit, you will find a good explanation of homophones that can be easily adapted any grade level including regional homophones which is basically that some words are only homophones in a particular region and dialect. To learn about homophones and how to use them properly, the author uses graphic organizers, worksheets, crossword puzzles, card games, and more written for each different grade level. I think my favorite was the tongue twisters using the homophones. We all laughed so hard that it hurt! Students learn and retain more when they laugh while learning. We need to bring the fun into more of our subjects. While learning the homophones that are in lists based on grade levels, a student creates a graphic organizer of each pair spelling each correctly, defining it in their own words, using it in a sentence, or even putting a picture with each. Each page can be done uniquely by the student allowing him or her to be very creative in the process. Then choose a worksheet or two with a couple of the activities. All of the student’s work should be kept in a notebook that they create to use and look back over for as long as they wish. Encourage them to add to the list of homophones whenever they find them. Student list records are provided to record the ones they learn. This little toolkit is quite versatile. Teachers can use it as a onetime unit or pull activity sheets periodically to spice up a day’s activities. Either way, your student is bound to discover that language is fun and interesting. Check it out at www.all-about-homophones.com. I don’t think you will be disappointed, but take my word for it; you need to exercise the tongue before tackling the tongue twisters. If you are looking for a math curriculum or supplement for next school year, I might have something good for you. Math Mammoth is a worktext series for different grade levels. The program was developed by a Finnish mathematician, Taina Maria Miller, who has taught school, tutored homeschoolers, and homeschooled herself. During that experience her heart was touched by the fact that many homeschoolers struggle teaching math because they didn’t have a good background. I understand this completely since I am learning disabled with math being my biggest weakness. Although many parents think teaching elementary math is easy, Mrs. Miller states that math often becomes rule memorizing without the whys. Children do not learn to think. They only use the rule to solve the problems for the day. I can relate to that. My own education was based on that rule memorization, and my struggles only became worse along with my self-esteem as I got into higher math. Mrs. Miller’s worktexts teach math thoroughly explaining the whys and allows children to discover the principles themselves creating mathematical thinkers along the way. The worktexts are self-teaching, so they are perfect for homeschoolers. With the explanations in the text, a separate teacher manual is not needed. This simplifies the entire process for the family. The series include quizzes and tests with the answer keys for each. In addition, the author provides internet resources which include some really great math interactive activities for the concepts covered. All of the packages are affordable for grades 1-8 covering all concepts. Affordability is something the author has striven for with her products. Some are even electronic downloads with prices for each worktext as little as $2.00-$5.50. Several packages are available. The Blue Series which is 28 self-teaching worktexts covering everything from addition to decimals to geometry in a downloadable package for $70.00 or $75.00 for a cd. A math and language software package, Soft-Pak for Windows XP and Vista, is also included with that package for free. Mrs. Miller’s website also has a separate worksheets collections available for grades 3 through 7 and additionally, Algebra I. These are great for regular school teachers to use for homework, and homeschoolers will find them useful as supplements to any math curriculum they are using. These sheets are far better than mechanical worksheets created by a script with problems emphasizing understanding of concepts and practicing computation. You can also sign up for teaching emails on her site where you will receive 280 free worksheets, 7 math teaching articles, emails discussing her books, and the Homeschool Math Newsletter for free. From all of this information, I think you can see that Mrs. Miller seems to genuinely care about the teaching of math and not just making money. Her program really works with so many children. Two of mine are using her products now and are excelling for the first time despite their learning challenges. The students say they can now think about the ways to do a problem without just trying to remember a rule that fits. These two now beam when they see its math time instead of groaning. That alone makes me feel better as their teacher, too. Check out Math Mammoth at www.mathmammoth.com for more information.